They practice on Sunday? I'm off and really want to head up. They do practice tomorrow! I'll be there. Hopefully I'll see someone up there! I know it's early but JJ is killing it so far. Jernigan just beat Corey Webster for a 30 yd catch. Good practice so far for Jernigan. Jernigan having a great practice so far. Jernigan is the star of the show today. He looks drastically improved from a year ago. Jerrel Jernigan – For the second straight day, Jernigan stood out amongst his teammates, hauling in several impressive catches and running precise routes. He appears substantially better than a year ago and may be rocketing himself up the depth chart with a series of very quality practices. I was thoroughly impressed, and surprised, in what I saw of Jernigan today and would go as far as to say he out-performed all other wide receivers. The #3 spot may very well be in his future. I still maintain that Jernigan is going to have a difficult time playing on the outside in the the NFL, and Cruz has the slot position on lock down. I don't know how he's going to fit into this offense. And it seems like everyone continues to talk about Wilson's speed and quickness. In my time as a Giants fan, I don't remember a rookie getting so many compliments from coaches and teammates. 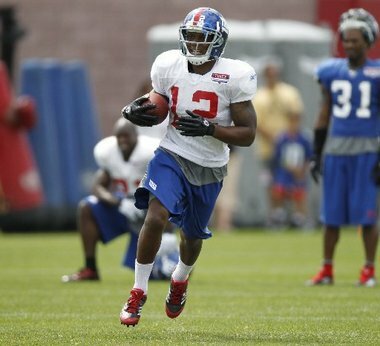 Gilbride and Eli have both stated that he's the fastest RB they've had. And just today, Deihl and Cruz kept the compliments coming. Expecting big things from our new look running game. Chris Snee and David Baas hopefully fully healthy. Addition of a great blocking TE in Martellus Bennett. Henry Hynoski in his second season. Combine that with a talented RB like David Wilson, and I think we could go from being last in the league in rushing to top 10. I read something somewhere where they were saying that Jacobs and Bradshaw had similar running styles (power) and that Wilson should be a genuine change of pace back this year. I could also see Jernigan getting some passes out of the backfield maybe? Or they could start using Cruz on the outside if Jerny really makes them use him. I'm not so sure he couldn't play outside. He's actually bigger than Mario...He was known for his toughness as well as his speed at Troy and I think he's stronger than a lot of people here think. The Giants went into this offseason with him in mind for the role of #3 albeit they did draft Randle, I think he can bring a nice package to the corps with his speed and quickness. Overall I think he could compliment what the Giants do in the passing game and could become a serious weapon. You can line him up anywhere. He is not bigger than Mario. Bigger does not mean taller. Sure...so you're basing your argument on what could equate to a large dump? With all due respect...what the hell are you talking about?... Are we arguing here?? Bigger does not equal taller...plain and simple which is what I literally meant. Jernigan is 4 inches shorter than Mario and 5lbs heavier. He is bigger! And the point I was trying to make is that some people think because of his height that he's not strong enough to beat jams in press coverage. He's stronger than people think he is and in reality if Mario with his thin frame could do it I don't see why JJ couldn't also. Especially when these guys spend all of their time working on and perfecting their craft...Not to mention he's played and has plenty of experience at all three of the x, y and z receiver positions in college with success. That doesn't mean he'll be successful at it in the NFL but it doesn't hurt the fact that he does have the knowledge and experience. Five pounds is nothing. You can lose five pounds of water workout during a long workout. More compact? Sure. But saying Jernigan is bigger is disingenuous at best. 5lbs and 4inches shorter. You have to realize that's a big difference in comparison to Manningham in terms of their frames. They both look relatively similar to me but since Jerrel is some inches shorter, he should be more compact. It's funny how this is turning into a debate when all I stated was a fact as per reason why Jernigan shouldn't be limited at beating the press. Anyone want to give their opinion on the point I was making cause this is defeating the purpose and just nit-picking?